Location. 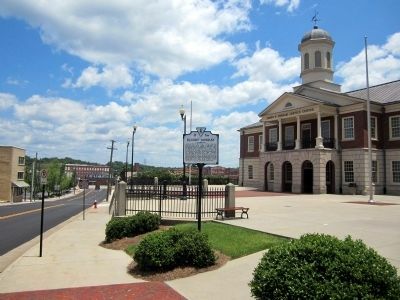 36° 35.207′ N, 79° 23.505′ W. Marker is in Danville, Virginia. Marker is on Patton Street east of South Union Street, on the right when traveling east. Touch for map. 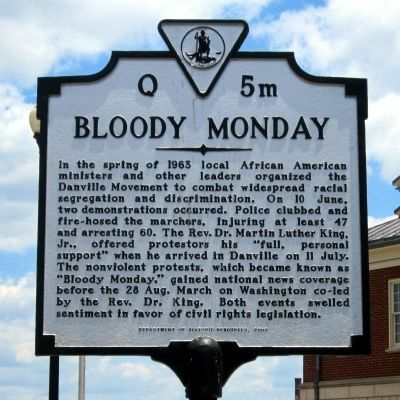 Marker is in this post office area: Danville VA 24541, United States of America. Touch for directions. (about 400 feet away, measured in a direct line); Prison Number 6 (about 500 feet away); Confederate Prison No. 6 (about 500 feet away); Danville Tobacco Warehouse and Residential District (about 800 feet away); The Worsham Street Bridge (approx. ¼ mile away); High Street Baptist Church (approx. ¼ mile away); 750 Main Street (approx. 0.3 miles away). Touch for a list and map of all markers in Danville. More. Search the internet for Bloody Monday. Credits. This page was last revised on June 17, 2017. This page originally submitted on June 16, 2013, by Bernard Fisher of Mechanicsville, Virginia. This page has been viewed 958 times since then and 34 times this year. Photos: 1, 2. submitted on June 16, 2013, by Bernard Fisher of Mechanicsville, Virginia.